The illumination corresponds to the poem Pearl, where a poet’s deceased daughter reappears to him in a dream and comforts him in his time of grief. 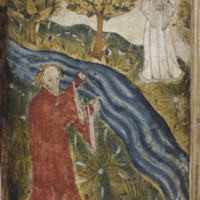 The father and daughter are standing at opposite sides of a river, and are both wearing long robes. At Pearl’s neck, a brooch (almost pearl-like in color) acts as a fastener on her high-collared tunic. 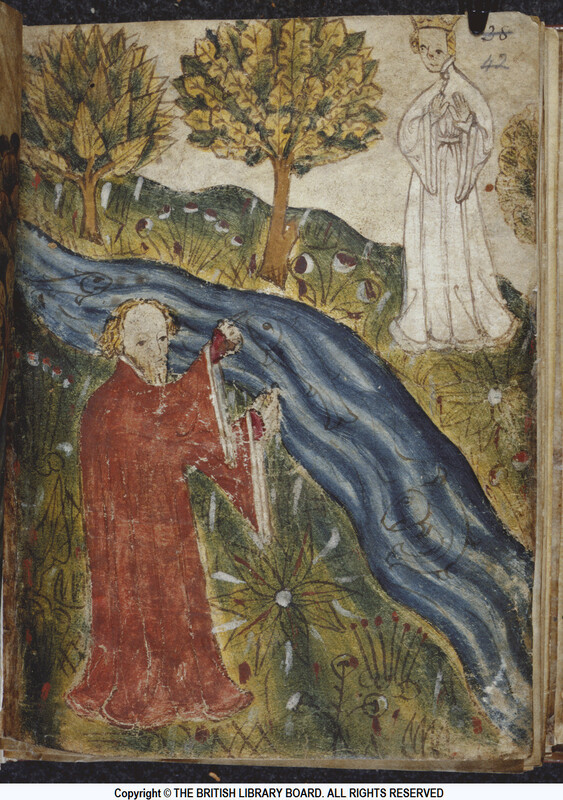 “The Poet and Pearl from the poem, Pearl (detail from MS. Cotton Nero A. X., f. 42r),” Medieval London, accessed April 22, 2019, http://medievallondon.ace.fordham.edu/items/show/55.